In its latest quarterly forecast for U.S. agricultural trade on Thursday, USDA reduced its fiscal year (October/September) 2019 export projections, “largely due to decreases in soybeans and cotton.” And news articles this week provided additional insight into the market ramifications of the ongoing trade war with China, while trade aid payments from USDA have begun to made to producers. With this background in mind, President Trump and China’s President Xi Jinping are scheduled to meet on Saturday at the Group of 20 summit in Buenos Aires. In Thursday’s “Outlook for U.S. Agricultural Trade,” USDA indicated that, “Fiscal year (October/September) 2019 agricultural exports are projected at $141.5 billion, down $1.9 billion from fiscal year 2018 and $3.0 billion from the August 2018 forecast, largely due to decreases in soybeans and cotton. 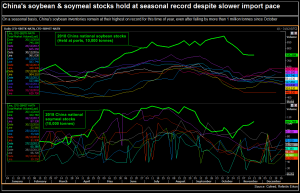 Soybean export volumes are down because of declining Chinese purchases from the United States as a result of trade tensions, and as a record U.S. crop continues to pressure soybean prices lower. 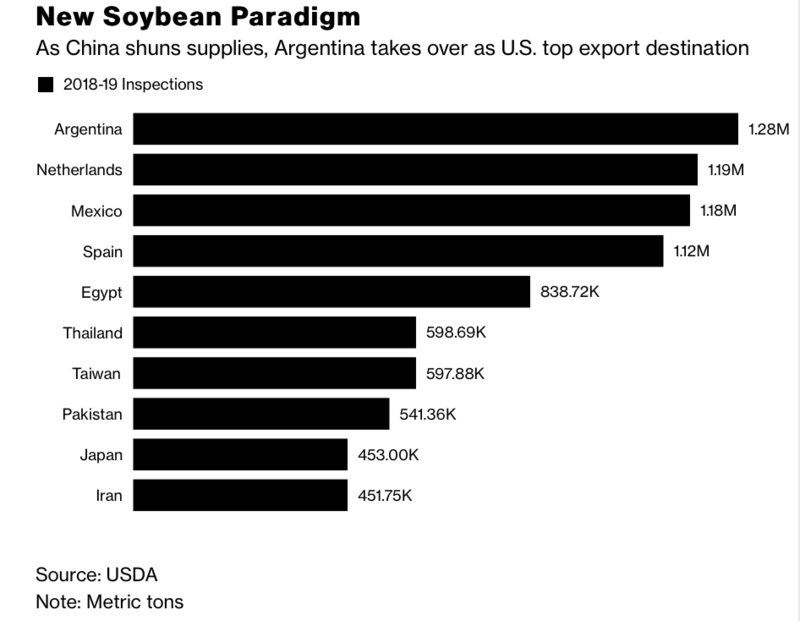 Bloomberg writers Shruti Singh and Dominic Carey reported earlier this week that, “Argentina has become the epicenter of soybean trading dynamics — at least for now. 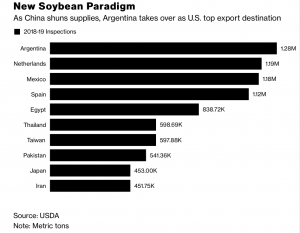 “Argentina Replaces China as Biggest U.S. Soybean Buyer,” by Shruti Singh and Dominic Carey. Bloomberg News (November 26, 2018). “Long Line of Soy Ships Sets the Scene for Trump, Xi Dinner Date,” by Shruti Singh, Pablo Rosendo Gonzalez, and Kevin Varley. Bloomberg News (November 28, 2018). 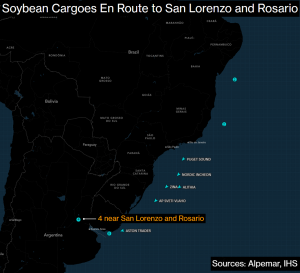 “There are 19 vessels en route or lined up to unload American soybeans in Argentina’s San Lorenzo and Rosario ports, shipping agency data show. 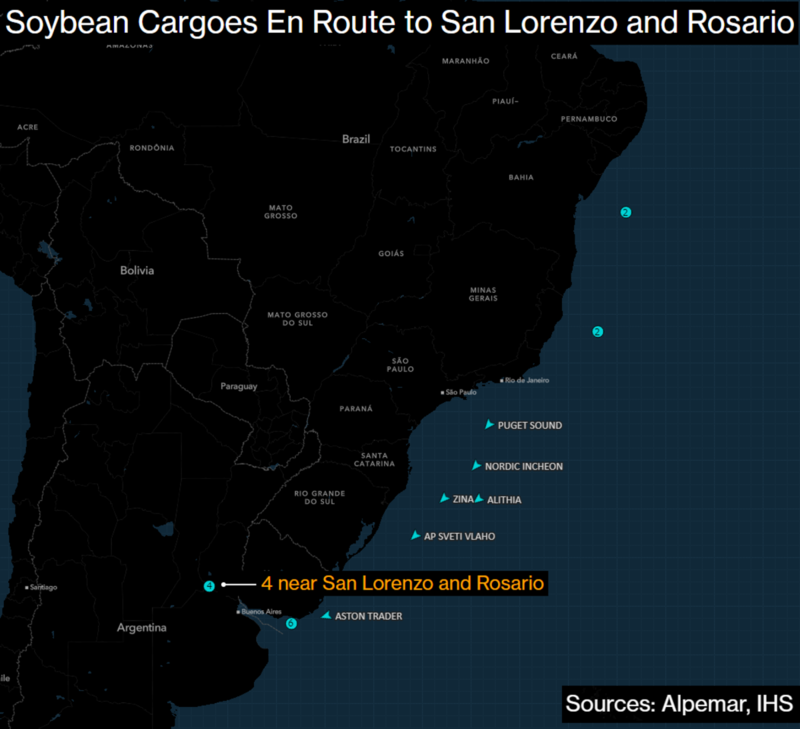 There were no U.S. bean cargoes to Argentina last year,” the Bloomberg article said. Reuters writers Naveen Thukral and Hallie Gu reported Tuesday that, “China’s imports of soybeans are set to drop as an outbreak of African swine fever hits its huge pig herd and saps demand for the animal feed ingredient, making it easier for buyers to keep shunning U.S. cargoes amid the Sino-U.S. trade war. “African swine fever, deadly to pigs but not harmful to people, has spread rapidly through China, with more than 70 cases reported across farms since early August. 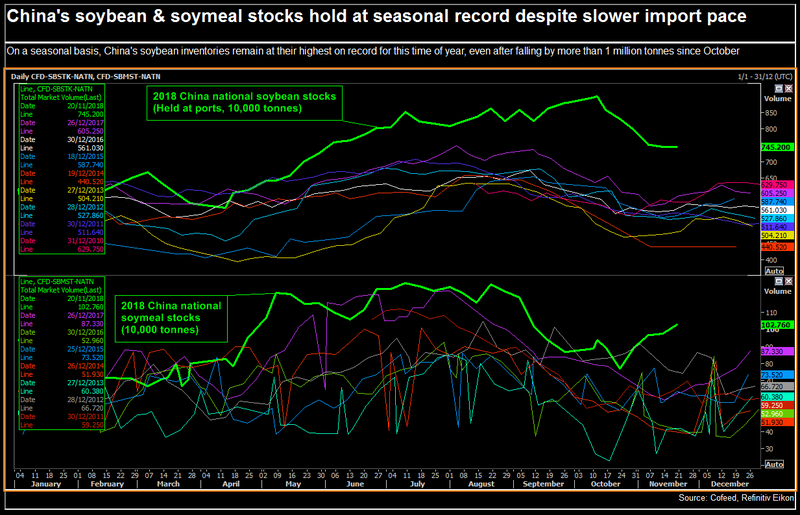 Reuters Graphic: China’s soybean stocks hold near seasonal record despite slowing imports. “Crop drop: China swine fever outbreak to curb its soybean imports,” by Naveen Thukral and Hallie Gu. Reuters News (November 27, 2018). Also on Tuesday, Associated Press writer David Pitt reported that, “American farmers still working to get out their remaining soybeans after a weather-plagued harvest season are struggling to figure out what to do with a record crop now their traditionally dominant export market is largely closed. Usually by this point in the year, 100-car trains filled with North Dakota soybeans would be moving to ports on the West Coast destined for China. But this year is different, after China all but stopped buying U.S. soybeans in response to President Donald Trump’s trade tariffs. Fearful of economic failure, farmers are frantically trying to determine how to store a potentially 1 billion-bushel surplus until it can be sold at a decent price. And Greg Hilburn reported this week at the Monroe News-Star (Monroe, La.) Online that, “U.S. Rep. Ralph Abraham filed a bill Monday to help Louisiana soybean farmers mitigate losses created by Chinese tariffs. The article explained that, “Soybeans from the Midwest that were being shipped to West Coast ports and destined for China were instead barged down the Mississippi River and parked in Louisiana ports and elevators. Mr. Hilburn pointed out that, “The U.S. Department of Agriculture’s Market Facilitation Program was designed to mitigate losses, but only harvested acres were eligible for the $1.65-per-bushel tariff retaliatory relief as part of the agency’s $12 billion rescue package. And Reuters writers P.J. Huffstutter and Mark Weinraub reported Wednesday that, “So far, $837.8 million of the total promised $12 billion [in trade aid] has been paid out, according to the USDA. The past year has tested the patience and resilience of Mr. Knopf, 40, who lives on the farm with his wife, Lindsey, and three children. For now, he is waiting to see what happens when Mr. Trump and President Xi Jinping of China meet at the Group of 20 summit meeting in Argentina on Friday and Saturday before deciding what to do with the rest of his soybean harvest. Lastly, Nicole Heslip reported on Thursday at Brownfield that, “A farm management specialist says USDA’s Market Facilitation Program will benefit farmers struggling this year.